In today's Covershot, Jese Siu remembers a typographic book cover which perfectly portrays the 'automatic poetry' by the artist Hans Arp, which is contained within its pages. I discovered the work of Hans Arp at the Stedelijk museum in Amsterdam whilst I was working in The Netherlands a few years ago. 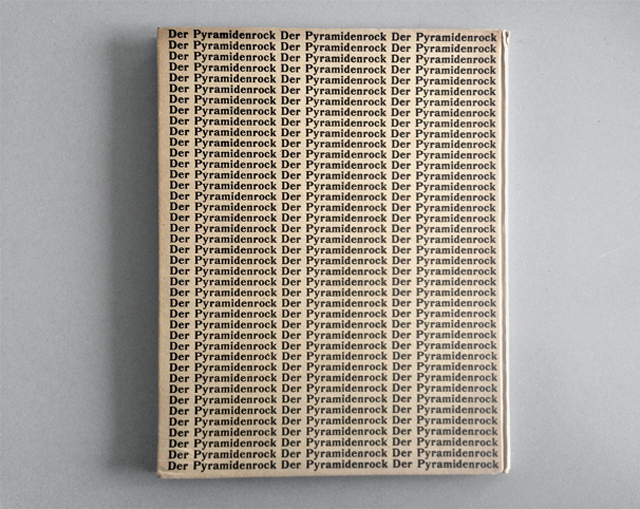 Der Pyramidenrock is a constellation of forty-one Dada poems that Arp refers to as “automatic poetry’” which may explain the mechanical nature of the front cover. Although Hans Arp is not primarily known for his poetry, his literature work is hugely inspiring for me at a time when I was beginning to question what I had chosen as a life-time profession. It changed the way I viewed my personal work, the way I work and the way I could work. More specifically, it highlighted the necessity as a designer to abandon control as a means of discovery. The poems within Der Pyramidenrock are similar to a large body of his artwork created under a process he named the “Law of Chance”. The choice of words in the poems was a mixture of descriptions of everyday life, confusing onomatopoetic words, forgotten bits of latin or a vague memory. The beauty of it was the fact it was written down without thinking or revision. Somehow the disconnectedness of these words provides a fascinating sense of rhythm. The reader is forced to use their imagination and through this, we begin to make formal associations to connect the dots. Arp’s poems are masterpieces of experiences, observation and investigation that at first glance, seem to be completely unrelated. …was also known as Jean Arp, depending on whether he was speaking in German or French. Hailing from Alsace-Lorraine and born to a French mother and a German father, Arp studied at the Kunstschule in Weimar. He is associated with both the Dada and the Surrealist movements, and then after that the Parisian group Abstraction-Création – a loose association of artists formed in 1931 to counteract the influence of the Surrealists. …studied at LCC before working for a number of design studios in London and The Netherlands. Past experiences include Magculture, Winkreative, Penguin and The Brand Union. Currently working as a Designer at Blacksheep – an international and independent design agency, specialising in food and drink. At almost all other times, she can be found working on personal projects, interesting collaborations or eating pistachio gelato.